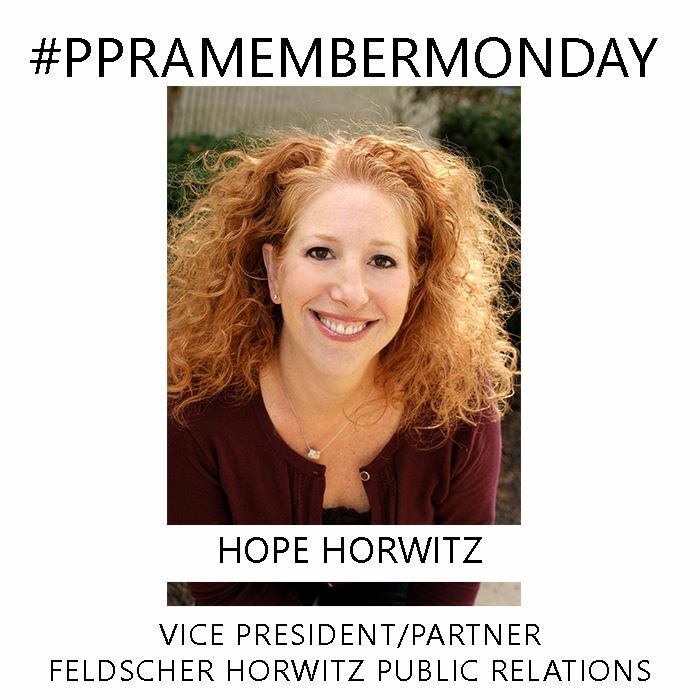 Hope Horwitz is Vice President/Partner at Feldscher Horwitz Public Relations. Hope has been a PPRA member for four years and serves on PPRA's programming committee. PPRA: Hope, tell us a bit about your background and your current job. HH: PR is in my blood. I grew up in the field as my mother (Sharla Feldscher) took me to her publicity events when I was a kid and to her office when school was closed. As an adult, it turns out I love it! I joined my mother in October 2013 and in early 2017, I officially became her business partner and we changed the company name to include me. Before that, I spent 15 years as an event planner and fundraiser before I met my husband and became a mother of two. HH: I mainly work with Spring Hills Senior Communities. They have eight assisted living communities across the country with one in Cherry Hill. They also have five all memory care communities called Poet's Walk open across the country, three more opening by February 2018 with plans for at least three more. Part of their company is Spring Hills Home Care, Renaissance Home Care in the Bronx and Brooklyn and Renaissance Adult Day Services. In addition to this, I work with the Subaru Cherry Blossom Festival every year — don't miss this year's events culminating in Sakura Sunday, an all day, outdoor festival highlighting Japanese Culture in Fairmount Park. It's so fun and will be on Sunday, April 15, 2018. FHPR also works with the Bucks County Playhouse, which is run by four Broadway producers. The shows coming out of the theater are amazing and working with everyone at BCP is a real joy! In addition to these clients, we work with String Theory Charter School, Rothkoff Law Group, the Philadelphia Youth Orchestra, a jazz band called TJP, as well as Paul Jost and many more! HH: My favorite part of my job is by far the creativity. We are lucky to work with such wonderful people so hearing what's coming up for them and then brainstorming the ways that we can create publicity, is so fun! HH: I've been working on the Spring Hills account for about three and a half years. Each month, I talk to 13 different Recreation Directors as well as the Executive Directors to find out what's happening. Some of my proudest accomplishments come from this partnership. Last year Spring Hills Cherry Hill Assisted Living hosted an Olympics discussion in the morning of the opening ceremonies for the 2016 Summer Olympics. Working together, we changed the event into our own Opening Ceremony and games, complete with Olympic Flame (made of paper of course), Katy Perry's theme song and crowning of the Gold, Silver and Bronze winners. It was such a success! Cyndi Long of NBC covered it, among others, but when the piece was thrown to her from the anchor, it was thrown FROM RIO! Also for Spring Hills, but for Poet's Walk Henderson outside of Las Vegas, we had great success when we told the story of an 11 year old boy who volunteers there. We had reporters from their NBC, CBS and FOX affiliates as well as a reporter from the Las Vegas Review Journal come to the community. HH: One piece of advice... I would say to stay open minded, don't be afraid to share your thoughts and ideas because you never know where they'll lead, and to be sure to build lasting relationships. Ok, that's three pieces of advice! HH: I've watched The American President again and again and again. I just love watching them fight to stay true to themselves, actually believe in what they're doing, be good people and to ultimately find happiness. HH: When I was younger I loved going to Kelly Drive to roller blade or sit and have a picnic. And I loved eating lunch in Rittenhouse Square. I think anything that lets me slow down and people watch makes it high on list. HH: Whiz wit of course — I'll add ketchup!